This spacious ground floor apartment comprises of an entrance hall, an open plan living room, kitchen with dining area, and two double bedrooms, master bedroom with ensuite shower room and bathroom with a four-piece white suite to include separate shower cubicle. 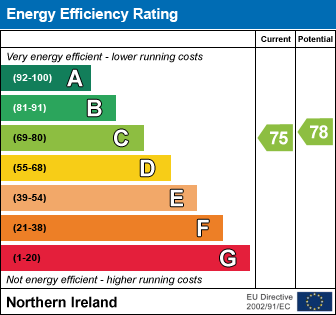 Further benefits include gas fired central heating and Upvc double glazed windows. This apartment offers bright and spacious accommodation and is ideally located just off the Rashee Road which is convenient to a wide range of local amenities, and offers excellent transport links to Belfast and Larne. Travelling countrybound along the Rashee Road, Rashee Mill is located on the right hand side just before Charles Drive. I am interested in Apt 1 Rashee Mill, 70-72 Rashee Road, Ballyclare. Please contact me about this property.